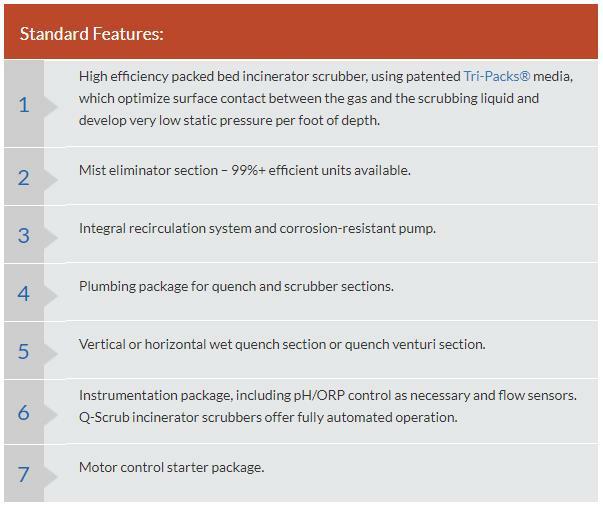 Q-Scrub Incinerator Scrubber delivers scrubber efficiencies of 95-99.99%. Systems can be engineered to guarantee any outlet rating. Most stack gas emissions requirements are based on a mass emissions standard of lbs./hr. in vs. lbs./hr. out for contaminants such as HCl, Cl2, SO2, HF, etc. Q-Scrub requires the lowest capital investment of any wet combination quench/scrubber system. 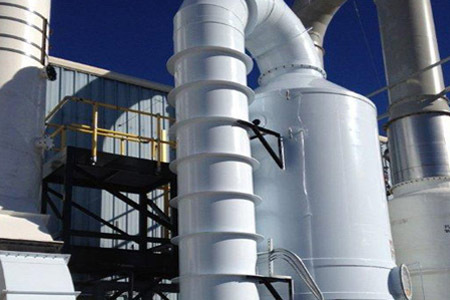 Operating costs are minimized through neutralization of corrosive flue gases, efficient use of chemicals, and low pressure drop. Materials of construction for the quench section include Hastelloy™ C276 and 316L to 304 stainless steel; high-temperature FRP is recommended for applications below 300°F. The scrubber section is manufactured in polypropylene, fiberglass or high alloy steel. For applications involving the removal of submicron particulates, see CCS option, which can incorporate the Q-Scrub for total control of gas and particulate, including submicron particulate. Q-Scrub interfaces with Tri-Mer’s Tri-NOx® Multi-Chem® system where NOx must also be destroyed. Multi-Chem is the practical, efficient solution to NOx emissions from all sources, at all loadings.